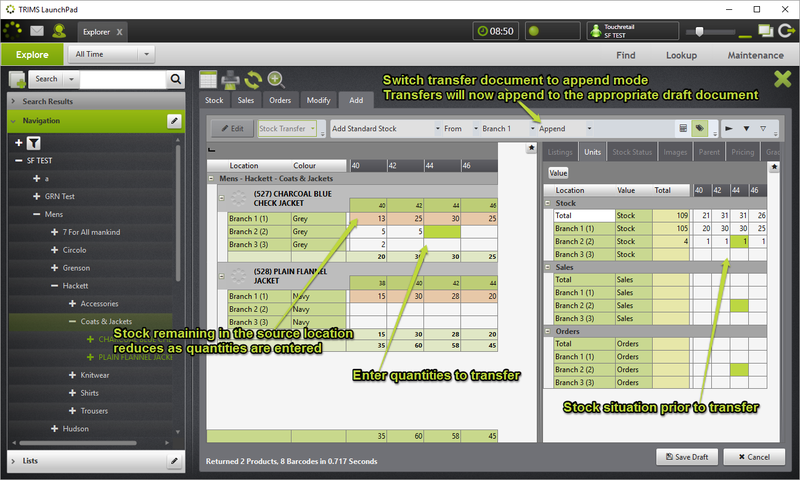 Create stock transfers for multiple locations on the fly using the new append transfer facility in TRIMS. The standard way of moving stock between locations is by creating a goods transfer document manually or via a mobile device. A goods transfer document is a document stating the source and destination locations, quantities, costs and various details to instruct and track the movement of goods. Rather than using this standard approach of working on one document at a time, therefore one location at a time, it is now possible to work on multiple documents at one time. Navigate through your TRIMS inventory and action transfers on the fly by toggling append mode. Now any actioned transfers will look for an open draft transfer between those locations and append to it, or create a new document if one isn’t available. The draft transfers can then be reviewed, adjusted if required and then set to pending.